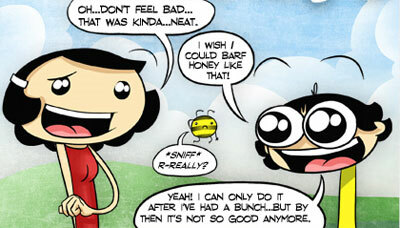 Dang, I wish I could barf honey. I’m no song writer, but I know how to write a mediocre review about the webcomic Pajama Forest! Evan Diaz, the artist behind the shenanigans that take place in the seemingly normal yet wacky world, mixes two different scenes. There’s the world in which “August” resides with a cast that slaps the abnormal balance on how normal August is. Then there’s the other take where Evan makes himself and his wife part of the comic from their World of Warcraft adventures to the do’s and don’ts on being a husband. Personally, I’ve been reading this particular webcomic for about 10 months now. I should have waited an entire year, but I don’t wanna wait that long! Even after someone commissions him to do a work, he’s been known to put that work up on the site and it’s pretty freakin good I must say. I’ve always wanted to see a ninja fighting cookies, but since I can’t draw, I’ve been waiting silently in the shadows for someone to request such a thing to be made. Swooping through the night sky of the internet, I pilfered this picture onto what scientists are telling me is called a “hard drive”. Only updated twice a week, if this strikes your fancy, you’ll find that two a week isn’t enough. But I suppose it’s like cookies on some cartoon show I saw long long ago. Have em all the time and they stop being special! The comics are there to tease you. Make you wait until you practically beg for the next one and offer your first born for it. Then it considers your proposal and then asks for more. Do you have what it wants!? Probably. Evan puts in the work in promotion and community interaction that some webcomics I’ve read just don’t do anymore. You’d be hard pressed to find a single entry that doesn’t have a response from him in it. The Shu has decided he likes this. The comic is light-hearted most of the time, but does have some strips that make you feel sad for August. There isn’t really much of anyone that I wouldn’t recommend this comic to, even just for some giggles. If you’ve got a sense of humor, you’re bound to find something in this that you’ll like. I really really want to give this a 10 out of 10 explosions, but… it just feels like there’s something missing for me personally. I love the stories, the art, the involvement, the characters. I can’t quite put my finger on it, but I’ll give this something special! It’s own freaking rating of 9.75 explosions out of 10! This entry was posted on June 19, 2010, 12:18 am and is filed under Webcomics. You can follow any responses to this entry through RSS 2.0. You can leave a response, or trackback from your own site. Holy bacon chef from the sky! Freakin Evan! You’re very welcome and thank -you- for the awesome comic!